NOTES : No tranfer errors. - the tapes state "1985" and "September 1984"
- the inlay states "November 1984"
- the program states "1984"
[frelon_synth_intro.wav] "Frelon, pressez une touche pour jouer"
A truly frenetic arcade game that would have you wondering where all the color clash went! Definitely an inspiration for the sorts of things the Oric can do if you give it a chance - smooth and playful animations, and a true arcade feeling. This was one of my favorites games. Grahics are excellent and easy to play. Great game! One of the best games for the Oric. For sure. It is a very nice arcade game. 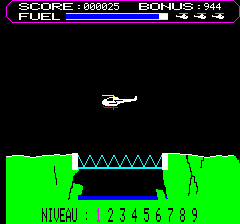 In this game, you must build a bridge with you helicopter which elements can be found among the 5 colorfull screens in order to let your convey cross the river. Ennemies are numerous (tanks, planes, ...), graphics are excellent, the game play is present and the overall game is very addictive. Not too easy, not too difficult, the game difficulty is well balanced. The music is... forget it and enjoy ! A bit dodgy on collision detection but it's forgivable. I loved this game. 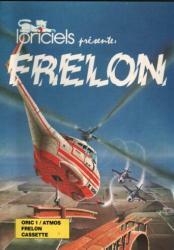 Frelon is a great Oric game, and alot of work must have gone into the game. The graphics are wonderful for such an old game. The Lorry is superbly drawn making full use of the Orics graphics. 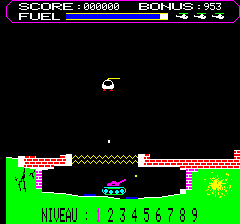 Unfortunately since everything seems to use attributes, scrolling and sprite movement is a little crude, however if you ignore this, Frelon is still a great game.